Cubicles and open office plans are hotbeds for disease and sickness. We’ve all been there – you’re trying to get work done and the person next to you is coughing and sneezing all day. We’ve all been the sick person, too. Neither role is fun, but each is inevitable in the winter months. Everyone has experienced that internal turmoil of whether or not to go into work when they’re not feeling great. Do you risk being seen as “faking sick” or not dedicated to work by taking a day off or push through it and get even more sick for not resting? It’s a tough choice that many people and parents face. Take a look at some of the statistics surrounding sick days and office life. The flu causes U.S. employees to miss approximately 17 million workdays. Unmanageable workloads are among the top reasons that employees, even if they have paid sick leave, show up at work when plagued with the flu. The CDC estimates that the vaccine reduces the risk of getting the virus by about 40 percent to 60 percent. Nearly 73% of workers said they caught a cold at work, and 32% blamed their fellow coworkers. Walgreens found that nearly 40 percent of respondents reported going to work when sick with the flu, and 1 in 10 reported attending a party or social gathering. 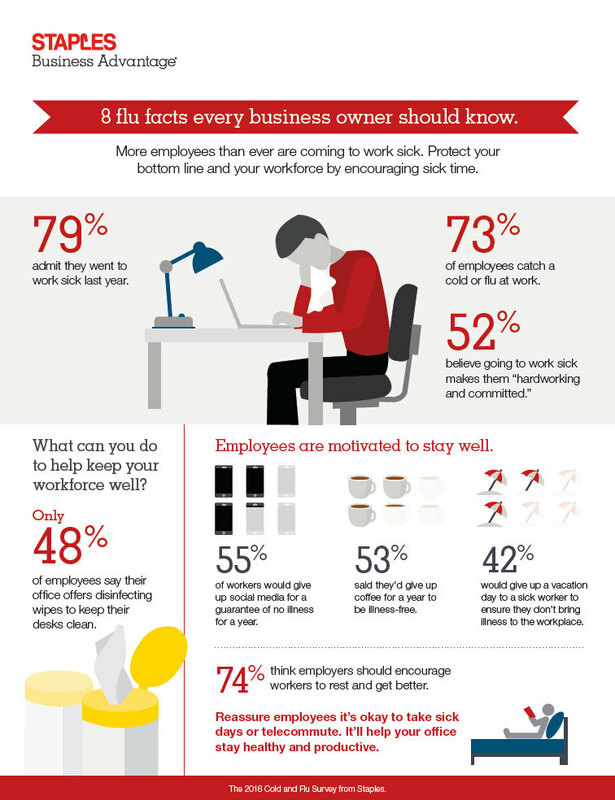 Although workers know that coming to work sick during cold and flu season endangers coworkers, almost 80% do so anyway. Despite the proven benefits of flu shots, the CDC says that only 20% of workers get vaccinated. 44% of workers called in sick when they weren’t to avoid sick workers. Nearly half of employees surveyed by Staples Business Advantage say they would give up a vacation day to allow a sick coworker stay home. 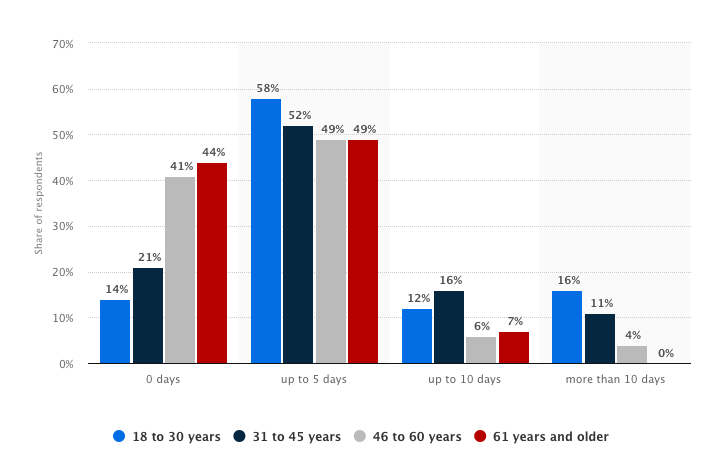 58% of 18 to 30 year olds took up to 5 sick days in 2017. It’s safe to say from these statistics that flu and sickness leads to productivity losses and economic losses. So, how to we keep our employees healthy and happy? We have some ideas for you. If you’re a boss or an employer who’s worried about these losses and want to do something it – think about changing the culture. Encourage your employees to stay home when they’re feeling sick. Use avoiding winter colds as an excuse to test out working remotely if your field allows for it. Use marketing to remind people to practice healthy habits at home and in the office. Invest in sanitizing wipes and other paraphernalia and keep them in plain view around the office. People will be much more likely to wipe down their stations, the copier, the water fountain, or other shared spaces if they see cleaning products nearby. Employers can even set up a day for a pharmacy to come to the office and offer flu shots. It’s important to think about your bottom line if you’re the boss. But, it’s also important to think about your employees, too. Their health and wellbeing is in your best interest. So, make sure to keep that in mind. In the long run, a couple of sick days is cheaper than an influenza outbreak.